Lunch is served! 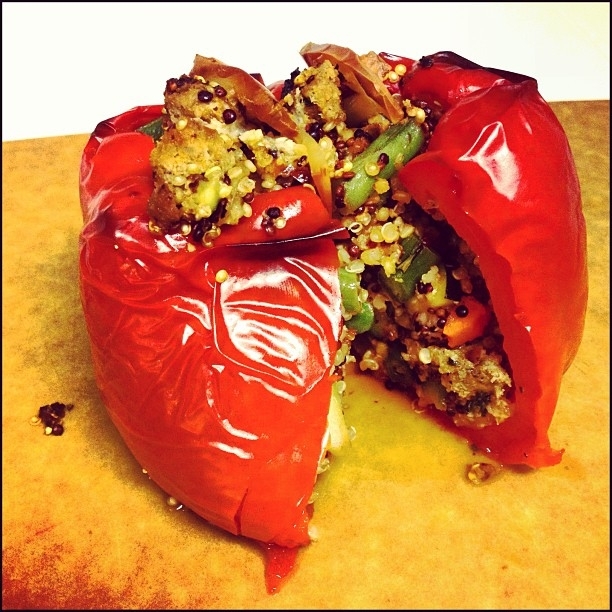 Try this stuffed pepper. In small sauce pan cook chopped onion and garlic clove in olive oil. Add quinoa and toast it for 30 seconds. Add 1/4 cup of water and salt and bring to boil. Lower temperature and simmer for 10 minutes. Meanwhile saute zucchini, chopped green beans, chopped carrot. Add finished qunioa to veggie saute and mix in tomato basil sauce, liquid aminos, mrs dash seasoning. Cut top off of a red pepper and take out seeds. Spoon veggie quinoa mix in and layer with Parmesan cheese until pepper is full. Top with one slice smoked Gouda and bake at 375 for 20-25 minutes!